Albertans, like other Canadians, are worried about whether they will receive the care they need as they age. News in Alberta is littered with revelations about problems with accessing appropriate elder care and questions about the quality of available care. Staff employed in the elder care field endure difficult conditions that make it challenging to ensure all elders receive the care they deserve. In this context, it is important to ask if the Alberta government is ensuring elders in this province receive the supports they require to live with dignity and in comfort. In response to this question, the Parkland Institute undertook a study of Alberta’s system of residential elder care. The study draws on quantitative data from Statistics Canada’s Residential Care Facilities Survey and qualitative data from the reports of Alberta’s Health Facilities Review Committee, as well as conversations with government and industry representatives, labour unions, seniors’ advocates, and front-line workers. Elder care services in Alberta are delivered either by a public body, a not-for-profit agency, or a for-profit business. Recent years have seen a fall in publicly-delivered elder care and a spike in for-profit facilities. Between 1999 and 2009, relative to the growth in number of Albertans over age 75, the number of residential elder care (either AL or LTC) spaces fell by 4%, while the number of LTC spaces fell by 20%. By 2008, Alberta had the second lowest availability of LTC spaces in the country. 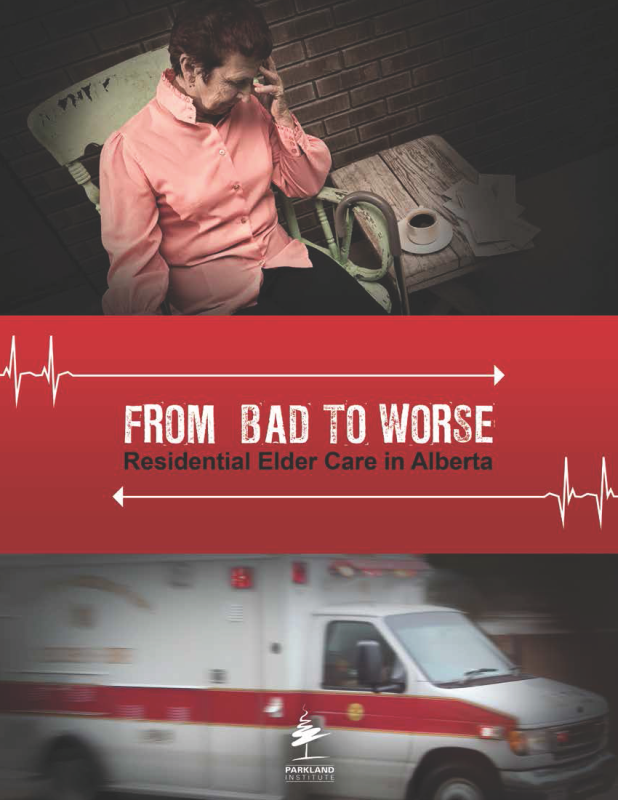 Problems in Alberta’s residential elder care are many and varied, and cannot be exhaustively addressed in the context of this relatively brief report. However, this report does identify three especially troubling areas. 1. Across residential elder care in Alberta, a significant gap exists between the care provided and the care required to ensure residents’ dignity and comfort. Examples of the consequences of the care gap include waits of up to 2 hours for response to call bells, meals rushed to a point that choking risk is increased, and inadequate staffing that puts both elders and caregivers at risk. 2. Based on evidence from beyond and within Alberta, for-profit elder care is inferior to care provided publicly or by a not-for-profit agency. Measured against benchmarks established by elder care experts, LTC in Alberta has often failed to achieve staffing levels that point to minimally acceptable care. Between 1999 and 2009, for-profit facilities fell short of the staffing levels that indicate reasonable quality elder care by over 90 minutes of care per resident, per day. While public facilities also fell short, they did significantly better than for-profit facilities. 3. Significant offloading has left many elderly Albertans and their support networks struggling to cope with burdens, both financial and otherwise, that at one point would have been alleviated by the provincial government. Offloading also has consequences for the wider community and the provincial economy. This report includes an analysis of Alberta’s for-profit residential elder care sector. While providing inferior care, these operations generate substantial profits. Between 1999 and 2009, private long-term care facilities in the province had an average return on investment [ROI] of 2.1%. Private AL facilities had much higher returns over that time, with an average ROI of 9.14%. This means that in recent years the returns received by the private residential elder care industry in Alberta have been higher than those of the US stock market, which over the same time-frame had an average return of 1.23%. The report also points toward difficulties in accessing information about residential elder care. In light of the termination of the Statistics Canada Residential Care Facilities Survey, the elimination of the Health Facilities Review Committee, repeated changes in programmes and terminology within Alberta, and the inconsistencies that characterize elder care across Canada, there is a need to ensure elders do not become lost in a knowledge gap. In sum, this report documents significant problems with residential elder care in Alberta. It makes clear how the provincial government’s policies of privatizing and offloading have negatively affected the well-being of Albertans. The evidence is clear: as more services have been provided by for-profit enterprises and as the available supports have decreased, elder care in Alberta has gone from bad to worse. 1. Expand the Canadian public health care system to encompass continuing care services, including all residential and home-based forms of elder care. The Government of Alberta should join with other provinces in lobbying the Federal Government to expand public health care to include continuing care services, including all residential and home-based forms of elder care. 2. Improve staffing. In recognition of the care gap across Alberta elder care, the Government of Alberta should immediately make available funds to facilitate improved staffing, with the provision that all operators (public, not-for-profit, and for-profit alike) be obliged to expend these funds on direct care staffing. The Government should ensure that all elder care facilities are legally bound to minimum staffing levels established in relation to experts’ assessments of the levels required to ensure equality care. 3. Phase-out private, for-profit elder care. Immediately suspend subsidies and programmes that benefit for-profit elder care corporations and work to phase-out for-profit elder care due to the abundant evidence that for-profit corporations provide inferior quality care. 4. Increase public access to information about elder care. Improve monitoring and reporting practices to ensure that meaningful data about elder care is available to all Albertans. 5. Create a watchdog. Establish an elders’ advocate to report to the legislature. An elders’ advocate would be positioned to monitor elder care, to track change over time, and to ensure the effective integration of the elder care system with other policies and practices that bear on the well-being of Alberta elders. The advocate should work closely with a committee of elder Albertans.